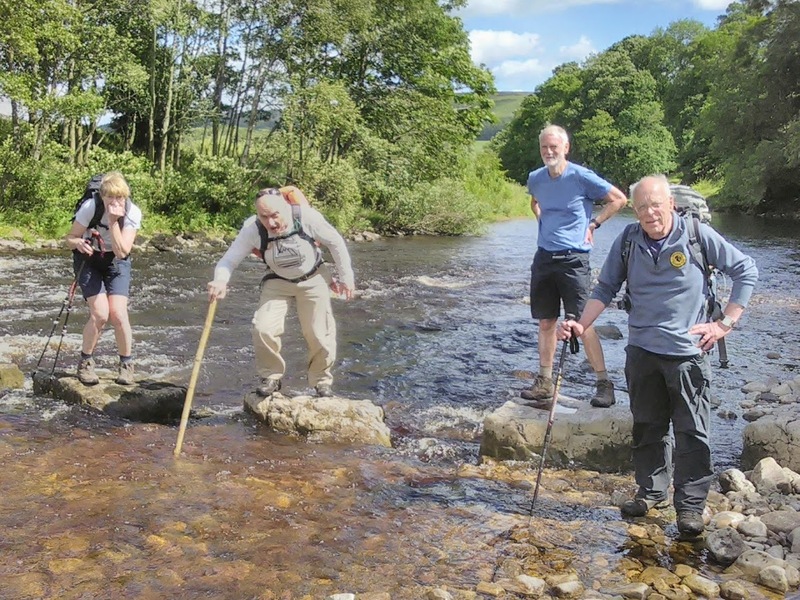 While Richard was busy organising the Quoits evening on June 21st, I took the opportunity to lead a short 6 mile walk over Marrick Stepping Stones. So Glenys, Graham, Yvonne, Peter and I left Grinton Bidge at 2pm along the river and through the fields to Wood House. Despite the river being as low as I've ever seen the farmer warned us that the morning shower had made the crossing dangerous. Indeed a couple of stones were wet and one was still gently washed by the Swale. With a helping arm or two we made it across and hacked our way through the scrub along the hollow way beside the old bank to the road. A quarter mile along the roadside brought us to the Cogden Hall meadows and the path to the Hall. A hard left in the farmyard took us up the track to Cogden Heugh for a coffee break before taking the road across the Gill before walking along Hirst Ridge and across Grinton Gill. I gave up on the map then and played it by eye, luckily finding the erstwhile mythical path down to the mill and Grinton Church. So after 6 odd miles we found ourselves back to the bridge having taken the veterans in the group on paths they'd never experienced before.Result!